Besides the famous sightseeing spots, there are many nice sweets shops in Kyoto, many of them located in small alleys. Many of these shops have a story and a long history behind them, and they take tradition seriously. Kisshokaryo is a sweets shop that takes kinako, roast soybean flour, very seriously, and is famous for its warabi-mochi. The shop is located a 5-minute walk away from subway Higashiyama Station. This shop is so popular among both Japanese and people from overseas that there is a line in front of it even before it opens. The first floor is the shopping area, and the second floor is the café. The most famous product they serve is the warabi-mochi, which is made from 100% bracken powder. The warabi-mochi here is sweeter than at other places, and has a nice stickiness to it. And don’t forget about their parfaits which look so great they’re bound to get posted on Instagram. 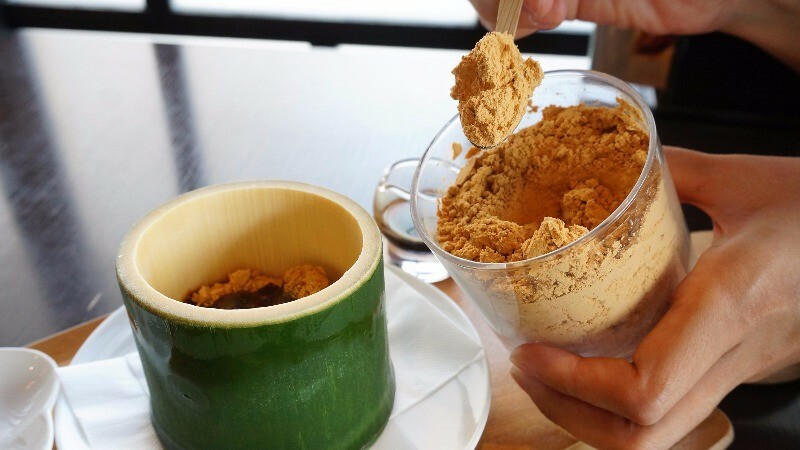 The warabi-mochi served at Kisshokaryo is made by hand, from 100% bracken powder, and for this reason they only serve a limited amount each day. You get to top the cold warabi-mochi with kinako and kuromitsu (Japanese black syrup). For those of you who like kinako, this is the perfect dessert, as you get to use as much kinako as you like. By adding kinako and kuromitsu you can adjust the sweetness of it. This layered tall parfait is a hit on social media. The layers are kinako and vanilla ice cream, soymilk blancmange, and hojicha jelly. Then this is topped with a kinako merengue, making the texture of this parfait something you probably have never had before. The taste is not too heavy, and I almost felt like I could go for another one after eating mine. This cake gets its black color from bamboo charcoal, and inside it you can find normal whipped cream, kinako whipped cream, and warabi-mochi jelly. The cake has a slight taste of honey-like taste to it, and eating it feels almost like you were eating a kinako version of a cream puff. I really like that this cake roll contains kinako whipped cream in addition to the normal type! This milk jam is made by boiling milk from Hokkaido and sugar together, and after this liquid becomes paste-like, kinako is added to it, making it something a kinako-lover can’t miss. It can be used on toast, ice cream, or you can make a kinako latte with it. It’s on sale on the first floor, so be sure to check it out! You can add as much kinako as you like to your rice cakes or parfait, and make these sweets taste even better! Use the wooden spoon to scoop up some kinako, put it on your “mochi,” and then pour some kuromitsu (Japanese black syrup) on top of it. Perfect! They have all kinds of souvenirs on sale too, so if you have time after eating, why not take a look at them too? The warabi-mochi is all made by hand by Japanese sweets artisans, and they are nice and cold, and when eaten with kinako they taste wonderful! You can eat as much kinako as you want, which was me was great: I love kinako! When you come to Gion, you may want to have some matcha sweets but don’t forget about kinako! The cookie-like merengue top on the parfait really surprised me with its nice texture. This place sells all kinds of sweets that are all good and not too sweet. The shop is very popular and there’s often a line in front of it so I recommend you go to line up before it opens. A 5-minute walk from subway Higashiyama Station and a 15-minute walk from Keihan Gion-Shijo Station. Shop: 10 a.m.-7 p.m. Café: 11 a.m.-7 p.m. The shop is easy to access but popular so you may have to line up for a bit. But it’s worth it!